Disposable diapers are made to be super-absorbend and super-durable — all the better for handling the all the waste produced by a human baby. All the worse for the environment because the diapers last hundreds of years in landfills. But a new project cut waste by using the diapers to grow mushrooms. The idea came after considering that mushrooms feed on cellulose, material present in diapers, but they also possess non-biodegradable synthetic elements such as polyethylene, polypropylene, and superabsorbent gel (sodium polyacrylate) which collects fluids. To test the idea, researchers sterilized diapers containing liquid waste with an autoclave and added lingrin (needed for the growth of fungi). Thus resulted in a substrate suitable for fungi. Then fungus spores, grown on wheat or sorghum, was spread on the substrate, and the whole mixture was stored in a dark, temperature- and humidity-controlled environment. Then exposed to light, the resulting mushroom growth eliminated up to 80% of the diaper waste's volume and weight. "We were sure that did not contain contaminants or infectious organisms, and we performed an analysis and found that the contents of protein, fat, vitamins and minerals are the same as that of commercial yeast. It shouldn't have to be different, mainly because diapers are sterilized ", he says. 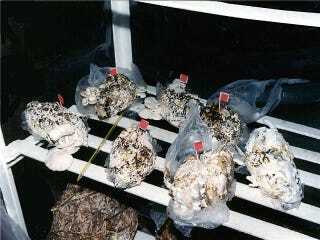 It is important to note that these experiments were carried out on a small scale, and cultivated mushrooms have never left the lab so they are not for sale. "The project is not intended to produce mushrooms targeted for human consumption, since the main objective is to get rid of diapers to avoid damaging the environment more. However, the mushrooms could be used as food supplement for cattle, the gel can be used to increase moisture retention in some crops and the plastic can be sent to recycling", says the scientist.